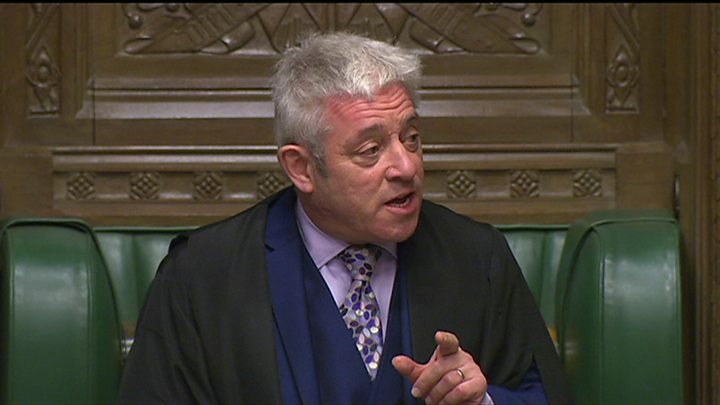 John Bercow has been accused of "unilaterally changing" parliamentary rules in the wake of a row over a government Brexit defeat in Parliament. Critics of the Commons Speaker say he broke with precedent and ignored the advice of officials when he approved a vote on the PM's "Plan B" response, which ministers lost by 11 votes. Mr Bercow said he had made an "honest judgement" in the interests of MPs. Commons leader Andrea Leadsom said his actions were "extremely concerning". But Tory backbencher Jacob Rees-Mogg defended the Speaker as "a House of Commons champion" - despite disagreeing with his decision - and said the amendment itself was "completely irrelevant [and] unimportant". On Thursday, Mr Bercow remained defiant in the face of more criticism from Mrs Leadsom during business questions, as she again accused him of "arbitrarily changing the rules" for the amendment. The Speaker told the Commons he required "no lessons or lectures" on how to do his job, and that he would carry on with his duties "no matter how much abuse I get". There were angry scenes in the Commons on Wednesday when Mr Bercow agreed to allow a vote on an amendment to a government motion tabled by Brexit rebel Dominic Grieve. The vote was ultimately lost by the government, meaning ministers will have to come up with revised plans within three days, rather than the three weeks previously agreed in law, if Mrs May's EU withdrawal deal is rejected by MPs next week. Did my MP vote For or Against Dominic Grieve's amendment? Data from Commons Votes Services. Click here if you cannot see the look-up. Ministers argued that the business motion, tabled by the government, was not amendable and said the Speaker was breaking with long-standing precedent in saying it was. Mrs Leadsom was among MPs to challenge the basis of his ruling and ask for clarification in a series of points of order after Prime Minister's Questions. She later told ITV's Peston programme that it had set "a very damaging precedent" for the conduct of business in the House and the passage of future legislation. "I am extremely concerned about the decision that was taken today," she said. Media captionBercow: "Anti-Brexit sticker belongs to my wife"
"What happened today was that the Speaker, instead of being the guardian of the rules, decided to unilaterally change the rules... It doesn't just damage me, it damages all of Parliament." Mrs Leadsom said Mr Bercow's future was a matter for him but asked if she was questioning his impartiality, she said she had the "greatest regard" for the office of Speaker. Earlier in the chamber, ex-minister Crispin Blunt said Mr Bercow had served nine years in the job but questions now had to be asked whether he remained a "neutral referee of our affairs". But Mr Rees-Mogg said he was a "great admirer" of the Speaker, even though he believed the decision "could make parliamentary business extraordinarily difficult". 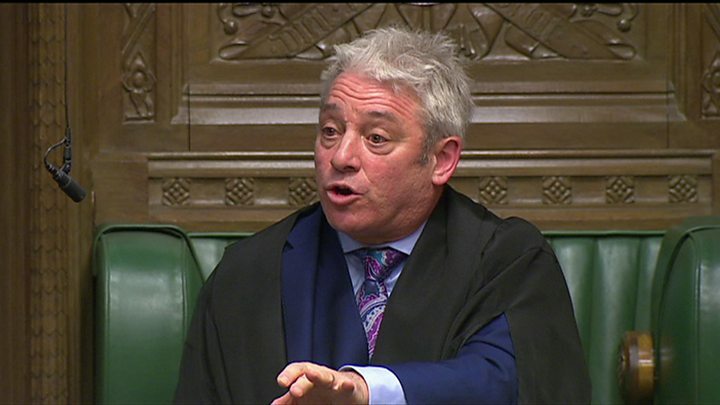 He told BBC Radio 4's Today programme: "I happen to think on this occasion Mr Speaker came to the wrong interpretation, but that doesn't mean I think he is not a fair speaker and a good speaker. "I do think... that the speaker's interpretation was eccentric, but I don't think it is part of a plot or undermines his standing or any of those things." Mr Bercow rejected calls to publish the advice he had received from his clerks. In making his ruling, he argued that if Parliament was always bound by precedent "nothing would change and things do change". He was "not setting himself up against the government but championing the rights of the House of Commons", adding that if people wanted to vote against the amendment they could. The BBC's parliamentary correspondent Mark D'Arcy said it was a "massive ruling", made reportedly against the advice of the Commons Clerk, Sir David Natzler. Since being elected as Speaker in 2009, he has angered many Tory MPs for his handling of business and treatment of MPs, but he also has many admirers, particularly on the Labour benches, who believe he has transformed the way Parliament holds the executive to account. He sat as Conservative MP for Buckingham from 1997 but, in line with tradition, quit the party and sits as an independent since becoming Speaker. He has said he voted Remain in the 2016 referendum but insisted he was impartial as Speaker.